With the rather turbulent times in which we live in and the current state of the warring political parties in the United States, Stanley Kubrick’s savage black comedy about nuclear war, Dr. Strangelove, or: How I Stopped Worrying and Learned to Love the Bomb (1964), is more relevant than ever. Brigadier General Jack D. Ripper (Hayden) has given the launch codes to send his squadrons of B-52 bombers to Russia in a pre-emptive strike in what he rationalizes as an action to protect the bodily fluids of every American citizen. Quite obviously he has snapped his cap. General “Buck” Turgidson (Scott) is notified of what has happened and meets with President Merkin Muffley (Sellers) in the War Room to figure out how to stop Ripper and his men. It isn’t going to be easy as the bombers, led by Major T.J. “King” Kong (Pickens) and his crew, are already en route, ready and prepared to go “toe to toe with the Rooskies,” as he so eloquently puts it. The rest of the film plays out in a tense, yet absurdly funny race against time as the President sends men to relieve Ripper of his command and tries to recall all the bombers in time. Dr. Strangelove was made during the height of Cold War paranoia when American citizens were taught to hate Russia because they supposedly threatened our way of life. The Cuban Missile Crisis in 1962 brought the world dangerously close to nuclear war and Kubrick’s film was clearly a response to the universal fear of a nuclear accident and destruction. Kubrick maintains a distance from the events in the film and yet mixes intimate human drama, like Group Captain Lionel Mandrake’s (Sellers again) futile attempt to reason with Ripper, with a, at times, pseudo-documentary style (the use of narration at the beginning of the film) like a newsreel. He even employs hand-held camerawork in the attack on Ripper’s air force base and this gives it a realistic, spontaneous, and most importantly, urgent feel. As the film progresses, there is an overwhelming sense of escalating helplessness. And yet, Kubrick (and co-screenwriter Terry Southern)’s focus on the satirical elements is right on the money. Their treatment of the characters is realistic per se but exaggerated for maximum comedic effect. Everyone plays the film straight because the situations they find themselves in are so outrageous. The characters are deliberate stereotypes who act in particular ways. Specific, colorful names for the characters amplify their baser instincts and heighten the satire: Colonel Bat Guano (Wynn), Major “King” Kong, and Premier Kissoff. Kubrick presents these characters as intentional caricatures in a mechanical fashion. For example, Buck’s cartoonish, often animal gestures reduce him to a character one might associate with a Looney Tunes animated short film. Other characters, like General Ripper, are shot at low angles that amplify his obvious madness. He often has a huge phallic cigar clenched between his teeth, captured mostly in close-ups to show his dehumanization brought on by feelings of impotency which prompt him to launch the bombers. Major Kong is shown as a western hero, complete with cowboy hat and posse mentality. However, one of the most memorable characters is none other than Dr. Strangelove (Sellers yet again). He works for the President of the U.S. and yet he is also the stereotypical Nazi, a mechanical man confined to a metal wheelchair. All of his movements seem programmed and he uses robotized gestures to prevent him from giving a Nazi salute (which he does eventually). There is something absurdly funny about his bizarre gestures that only heighten the comedy of his scenes. Dr. Strangelove is a nightmare comedy about annihilation. For the satire of the film to work, we must be distanced from the seriousness of the subject. In effect, by the film’s end, we have learned to “love the bomb” as the film’s title suggests, by giving into the comic, satirical nature of the film. Kubrick’s film is eerily relevant now because much of what he was mocking still exists. This Blu-Ray transfer is flawless, presenting Kubrick’s film with a clarity that is impressive to behold. The folks at Criterion come through again. As one would expect, this release is packed with extras. There is a new interview with Kubrick scholars Mick Broderick and one with Rodney Hill where they talk about the filmmaker as producer and the archetypes presented in the film. These two featurettes are loaded with fascinating information. There is a new interview with Richard Daniels, senior archivist at the Stanley Kubrick Archive, who talks about the archive and, in particular, Dr. Strangelove. Also included is a new interview with cinematographer Joe Dunton and camera operator Kelvin Pike who talk about the amazing look of the film and how it was achieved. David George, son of author Peter George, whose novel Red Alert provided the basis for the film, is interviewed and talks about how his father worked with Kubrick. Carried over from a previous edition of the film is “The Art of Stanley Kubrick: From Short Films to Strangelove,” a solid profile of Kubrick from his humble beginnings as photographer in New York City to his work on Strangelove. This is a very well done overview of Kubrick’s early career. “Inside Dr. Strangelove or: How I Learned to Stop Worrying and Love the Bomb” is an excellent, in-depth 46-minute documentary on the making of Kubrick’s masterpiece. Before embarking on the project, Kubrick had read over 50 books on nuclear war before his producing partner at the time, James B. Harris, gave him Red Alert by Peter George to read. It would end up providing the basis for the film. Originally, Kubrick intended the film to be a straight drama but all night writing sessions with Terry Southern led to a more satiric approach. This is a fascinating look at how Strangelove came to be with lots of information and eye-witness accounts from the cast and crew that were still alive. 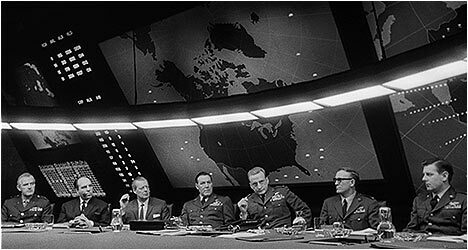 “No Fighting in the War Room or: Dr. Strangelove and the Nuclear Threat” is an impressive 30-minute documentary that examines the social and political conditions that inspired and helped shape the film. The Russian threat to the U.S. was a great concern to our leaders at the time and an escalation in the nuclear arms race was inevitable. Legendary Watergate whistleblower, journalist Bob Woodward and former United States Secretary of Defense, Robert McNamara provide the necessary context while filmmaker Spike Lee also offers his observations. “Best Sellers or: Peter Sellers and Dr. Strangelove” examines the comedic genius of this talented actor. Shirley MacLaine, Roger Ebert and Michael Palin gush about Sellers but the real treat here is rare, vintage home movie footage of the young comedian honing his craft. There is also “Split Screen Interviews with Peter Sellers and George C. Scott” that were done on the set of Strangelove for promotional purposes. One quickly gets the impression that Scott didn’t suffer fools gladly and wasn’t crazy about doing the interview. Sellers, on the other hand, is a delight as he does the entire interview with an American accent. When prompted, he slips effortlessly into several different British accents, and even a few Scottish ones! There is an excerpt from a 1980 interview with Sellers on NBC’s Today show. Finally, there is a substantial “Exhibitors Trailer” and a theatrical one.